You may recall that when we started this iPhoto series I mentioned that Apple has done its best to automatically filter and file photos for you. Two additional ways that it’s done so is through the use of face recognition and location, better known as the Faces and Places features. iPhoto ’09 introduced both of these features, and they’ve been updated over the years. The Faces feature attempts to identify the human face within your images and queries you for the identities of the people they contain. Once you tell iPhoto that the guy with his tongue touching his nose is indeed Cousin Jo-Jo, it will then search your photo library for other images that might contain the black sheep of the family. You then confirm which faces are the aforementioned dark ungulate, and iPhoto then offers up another collection of possibilities. Keep confirming until iPhoto runs out of suggestions. 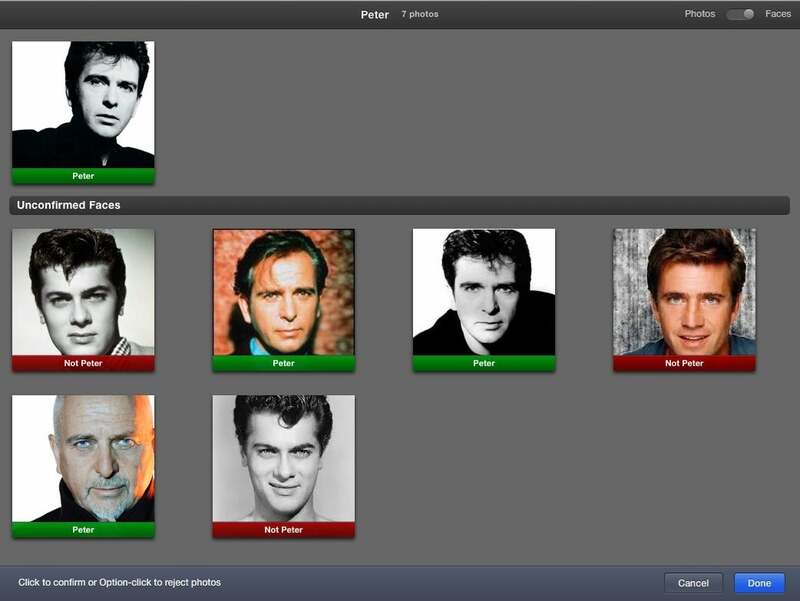 During this process, the identified images are tagged with Jo-Jo’s name, allowing you to select the Faces entry in iPhoto’s Library pane and view just those images that contain his baleful mug. Places depends on location data that’s embedded automatically by your camera (or mobile device that adds location information to your images’ metadata) or that you assign after the image has been taken. This can be very helpful if you’ve shot a load of pictures with your iPhone during your many sojourns to Manteca, California, and later wish to view that collection of images in a single album. Now that you have the basics, let’s dive in. When you import images, iPhoto will scan them for facial features. You can tell that the feature is doing its job if you see a spinning two-headed-arrow icon next to the Faces entry. When that icon disappears, iPhoto has made its best effort. Click on that entry and you’ll see a corkboard with three images on it (see image above). In a gray bubble beneath each image is the word unnamed. You’re welcome to click on these bubbles and enter the name of the person in the image. If a face appears that you don’t wish to identify, just hover your cursor over the image and click the X that appears in the upper left corner. That image will be taken out of consideration. Click Show More Faces to see more unnamed images. As you move from page to page, you may see images with the phrase “Is this [nameofperson]?” beneath them. 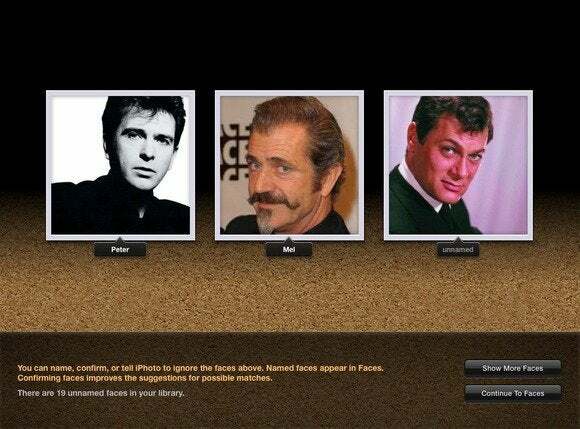 This is a broad hint that iPhoto is learning who’s who among the people in your pictures. Click the check mark to confirm that this is indeed that person or the X if iPhoto has guessed incorrectly. When you’ve identified as many faces as you care to, click the Continue To Faces button. The corkboard will now be populated with images that represent the people you’ve identified. So, one image for Cousin Jo-Jo, another for Aunt Merline, yet another for best friend Moose. Double-click on a face to be taken to that person’s screen. The images you’ve confirmed take up the majority of this screen. Below, you’ll likely see an entry along the lines of “Jo-Jo may be in 187 additional photos.” To the right of this informative tidbit is a Confirm Additional Faces button. Click this button and you’ll see a few rows of confirmed images and then an Unconfirmed Faces area in which more images that allegedly contain this person appear. To confirm that a face belongs in this collection, click on it. If, instead, iPhoto suggests that your dog is actually Aunt Merline, hold down the Option key and then click the image to reject it. iPhoto will attempt to separate the Peters from the Tonys from the Mels. Tip: A faster way to identify a lot of images is to click and drag all of them. This tells iPhoto that every image contains the person associated with this name. Then click on those that don’t contain the person whose entry you’re viewing. Doing so tells iPhoto they don’t belong in this collection. When you’ve done all the clicking you can, click once more on the Done button to be returned to that person’s page. However, now that iPhoto can better differentiate your aunt from the family pet, it may offer more images for you to approve. If so, click Confirm Additional Images again and approve or reject these pictures. It’s not unusual to go through several rounds of this process until you finally see “No unconfirmed photos of [name of person] found.” You can now click on the All Faces entry at the top of this screen and start work on the next face. Before leaving this view, however, note the Photos/Faces toggle switch at the top of this area. When you toggle to Photos the thumbnail image will show the entire picture. If you choose Faces instead, you’ll see just a close-up of the identified face. It’s not a bad idea to select the Faces entry every month or so and then click the Find Faces button at the bottom of the window. When you do this, you’ll be taken back to the identification page where iPhoto tells you how many unnamed faces are in your library. Run through the process I just explained to catch any faces iPhoto may have missed when importing your latest pictures. One more tip: You don’t have to go through this process if you want to tag just an image or two. Instead, select an image you want to add a face to, click the Info button at the bottom of the iPhoto window, and in the Faces area click Add a Face. The image will fill the window, and familiar gray bubbles will point at all the faces in the image. Click on a bubble and enter the name of the person the bubble points to.